How Cute Are My Parents? Hi Everyone! We’ve been super busy getting things ready for the wedding and for our RV Honeymoon! I’ve been crafting away and arranging and re-arranging reception layouts and Mark has been working on remodeling our RV (stay tuned for pics from that) & planning some routes for our road trip! 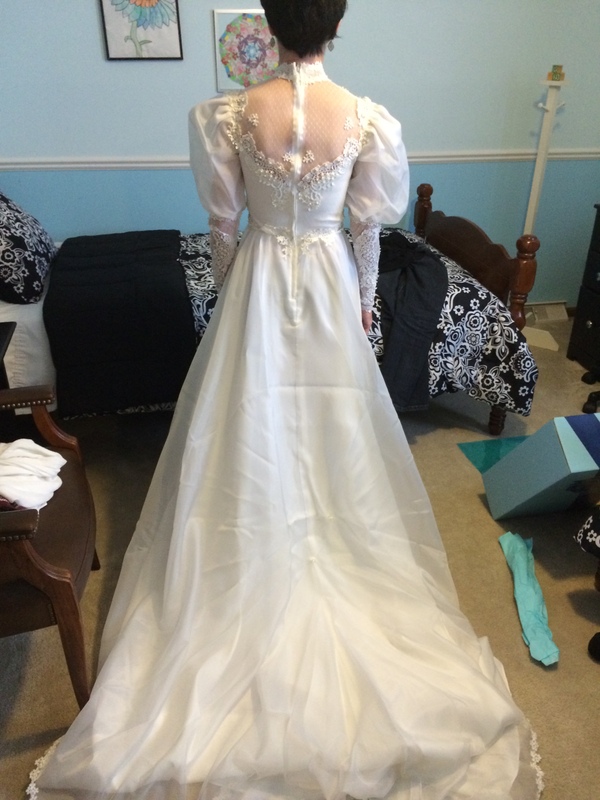 Buuuut, I did have my final dress fitting the other weekend and something really fun happened afterwards! 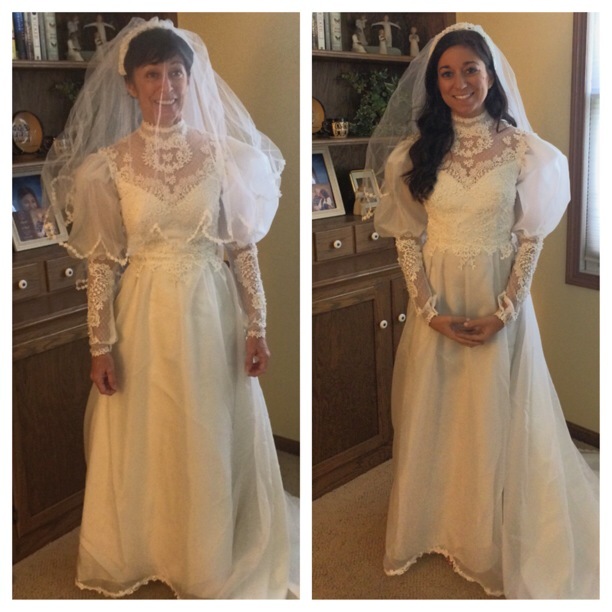 I asked/begged my mom to pull her wedding dress out from under my childhood bed and try it on! AND SHE DID, because she is a doll. Isn’t she such a babe? I was having so much fun I couldn’t stop there! So I tried on her dress too! I’ll admit, she rocked it better! And then my dad got himself involved in the festivities! I mean, how cute are they?! Overall it was a good day! My dress fits like a freakin’ glove and I LOVE LOVE LOVE it! I literally cannot wait until May 10 (btw, 12 days away) to show it off to my fiance/husband!! 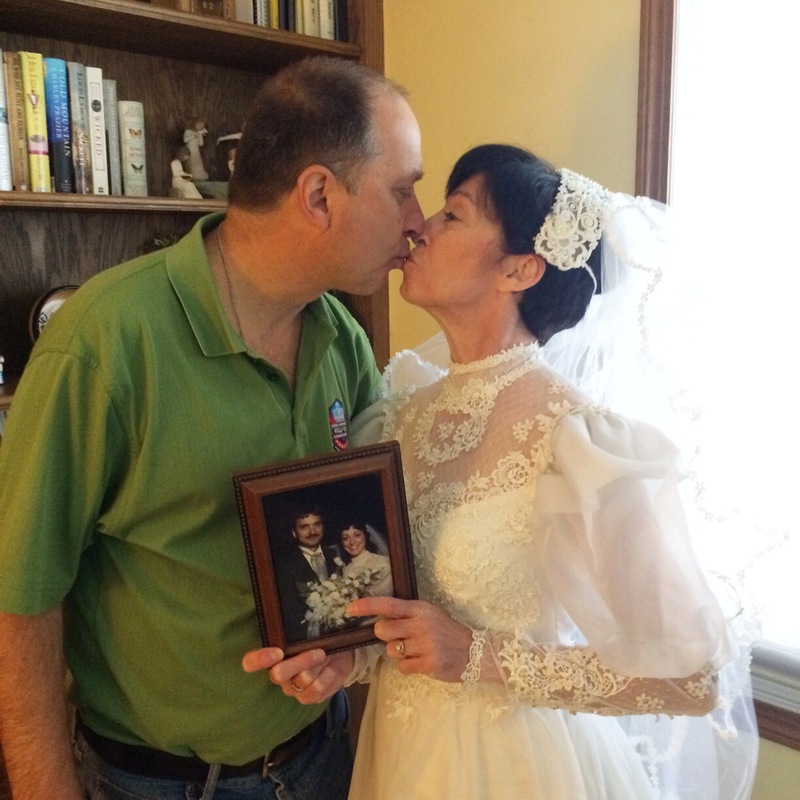 My mom pulled out her wedding dress for the first time since she wore it 27 years ago and my dad even turned off whatever game he was pretending to watch (while actually napping and snoring and disrupting dress up time) to take our pictures and pose with an old wedding picture! I can only hope that Mark and I have a marriage like my parents do and that 27 years from now, I will be pulling out my wedding dress and trying it on for my daughter after she has her final wedding dress fitting! Do You Want To Keep Up With Our RV Honeymoon! We Will Email You Updates Directly From The Road! Just Enter Your Email Below! Follow Our Journey On Instagram Too! Taking the ferry over to Connecticut today! So begins our east coast journey!! !